Fresh seasonal vegetables with our homemade dill or ranch dip. Homemade cheeseball with assorted gourmet crackers. Choose dried beef & Scallion, Chicken & Bell Pepper, or Smoked Salmon. Fresh seasonal fruit and our homemade yogurt dip. 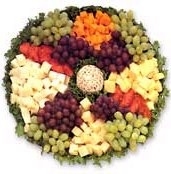 An assortment of fresh seasonal fruit and cubed cheeses. An assortment of fresh baked bagels served with cream cheese, butter, & jellies. An assortment of fresh danishes served with fresh fruit in the middle. A fresh variety of sandwich buns to accompany your deli meat & cheese tray. A freshly baked assortment of cookies just like mother made. Slices of top quality meats & cheeses. Don’t forget the roll & condiment trays. Sliced tomato, onion, lettuce, & assorted cheeses. Served w/ mayo & mustard. Traditional club sandwiches made on Texas toast and sub buns and arranged on a tray. No fuss, ready to eat! Please place orders 48 hours in advance. Free delivery in the Morgantown area!